The attribution of human-like form or characteristics to inanimate objects. 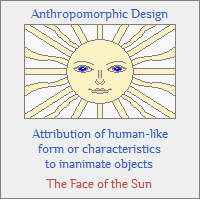 "Anthropomorphic Design" as a term of art has been popping up in leading places for quite some time. When we saw that it was being featured in the special 2014 "robots" issue of Stanford Magazine, we decided to do a blog about it as a coming trend that is marked by a highly distinct present and a very rich past.